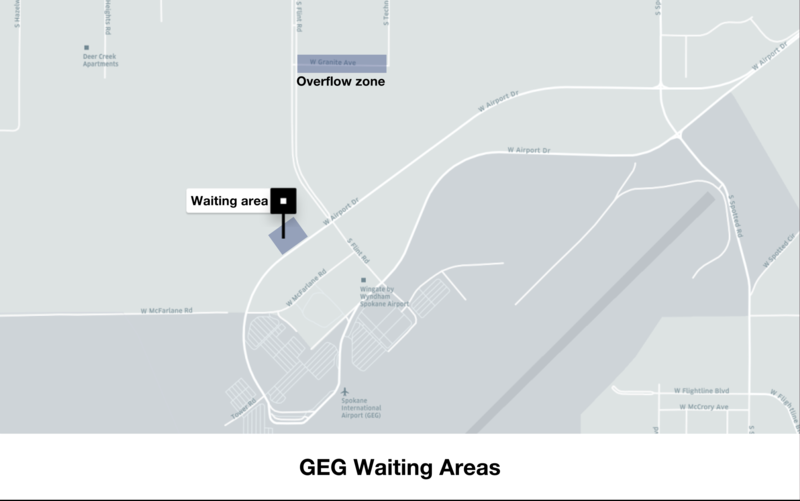 When driving at GEG, Learn how to receive these trip requests and get in on the action. Vehicles with taxi lights are prohibited from operating. Driver-partners may not wait longer than 5 minutes in front of the terminal. If the rider is not ready, driver-partners must cycle around Airport Rd via Flint Rd and return when the rider is ready. We’ve instituted a special first vehicle in is the first one out (FIFO) system at Spokane International Airport. The FIFO system only works within the designated, geofenced area and driver-partners waiting elsewhere will not receive trip requests through the Uber driver app. The Uber sticker (trade dress) must always be displayed on the vehicle’s windshield. Driver-partners can request this Uber sticker here. Spokane Airport restricts Uber pickups to the yellow pavement zones outside of each baggage claim. Picking up riders outside of these zones or without your trade dress (Uber U) risks citation by airport police. For waits longer than 5 minutes, please cycle around Airport Rd again via Flint Rd and return when the rider is ready. Based on the operating agreement with the airport, riders can be dropped off at the curb in front of the terminal. If you’d like to receive a trip request afterwards, you’ll need to keep the Uber driver app on to maintain your place in the FIFO queue. Checking the arrivals schedule at Spokane International Airport can help you maximize your earnings with information about when flights will be landing at the airport and when it will be busiest. See GEG ARRIVALS SCHEDULE.